This doesn't happen if my VM uses 100% DPI. If I change it to 150% it goes sadfaces. On things where we don't seem to cut out titlebar things (default theme) this is causing the minimize button to overlap with the tablist dropdown button (all-tabs button). On lightweight themes, we seem to be sizing the cutout for the titlebar buttons wrongly and so the minimize button is cut off instead. The height of the cutout is also wrong. I don't see any of this on windows 8. I wonder if this is related to bug 1173732 and if this both are win10-only problems. Dão, can you clarify if that bug happens on win8 or previous at all? I'm not 100% up-to-date on it (and don't have hidpi win8). > bug 1173732 and if this both are win10-only problems. > 100% up-to-date on it (and don't have hidpi win8). Erm, I don't know what happened with the needinfo here, but let's try again. FWIW, this didn't happen pre-build-10158, so in theory maybe MS will fix it before release? Or, alternatively, it might be an intentional change. This is making me think it's actually an MS bug, though I'm not 100% sure. > This is making me think it's actually an MS bug, though I'm not 100% sure. I can't check Windows 8 right now, but surely we'd have noticed by now if it was an issue there. > was an issue there. I don't actually understand bug 1173732, so, I don't know. Checked out Windows 8.1, this isn't an issue there. Setting "layout.css.devPixelsPerPx" to 1 or 1.5 in about:config scales the tabs / etc, but does not solve the issue. Checking "Disable display scaling on high DPI settings" in compatibility for the shortcut has no effect at all. Works for me with the letest Nightly. Bug 1173725 should be fixing this. 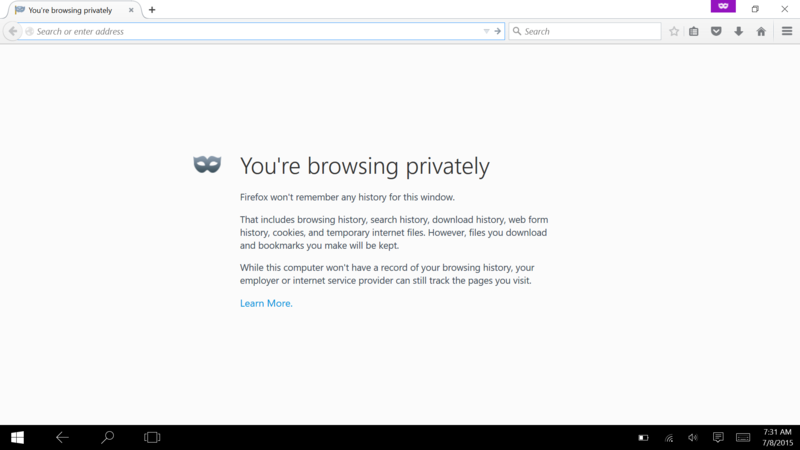 This seems to happen in private browsing as well, where the PB label from the title bar overlaps the minimize button. See: http://i.imgur.com/61Og7s5.png - screenshot from a Microsoft Surface Pro 2 using Windows 10 Pro x64 (Insider Preview Build 10162) with Beta 40.0b2 (20150706172413). It looks like this may have been fixed in build 10240? I didn't do a direct before-after comparison, though, and have only tested 150% so far. > before-after comparison, though, and have only tested 150% so far. I still saw this with lightweight themes in the build I just got (which I presume is 10240, but the build id on the bottom right of the desktop is gone, so I don't know for sure). Likewise, I still see overlap between the _/+\_ hover state and the minimize button when using the default theme (ie comparing the hover states). I'm also on 150%. Any idea what's different? Fixed by bug 1173725, anyway. Definitely appears to be fixed on 41.0a2 (2015-07-16) on 10240. > Definitely appears to be fixed on 41.0a2 (2015-07-16) on 10240.